Although a semi-regular visitor to Birmingham for many years, I tend to stick fairly close to the centre, coming and going via Birmingham New Street station. For that reason, while I’ve heard much about the excellent coffee scene in Harborne, the suburb to the west of the centre, I’ve never made my way out there. Until Saturday, that is, when, driving up to my Dad’s in North Wales, I realised that it made a good break-point for my journey, provided that I didn’t mind a 15-minute detour. I therefore made a beeline for The Steam Room, which opened in early 2017 and which I’d heard several good things about. 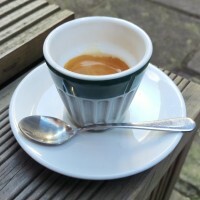 A little to the north of Harborne High Street in a very residential area, it’s a gem, serving weekly single-origins from Has Bean on espresso (including decaf), batch-brew and pour-over, with the decaf being given equal billing on the menu (always nice to see). There’s a decent selection of tea, plus craft beer and ciders, as well as wine by the glass/bottle. If you’re hungry, check out the regular brunch menu, with breakfast and lunch specials on the menu behind the counter, plus a generous cake supply from old friends, Cakesmiths. Coffee shop chains are strange things. Sometimes places expand quickly, adding shop after shop, building a strong brand name. Other times, a second branch is only added after long, careful consideration. And sometimes, that second branch is so far removed in look and feel from the original that, until the barista tells you about the connection, you are completely clueless. So it is with Mother Espresso, the Liverpool outpost of Manchester’s finest, North Tea Power, which opened a mere eight years after its parent and is about as different as can be in terms of look and feel. In my defence, as soon as the barista told me, I remembered, having read about the opening at the end of 2017 on social media, but by the time I came to visit, I’d completely forgotten about the connection, the name “Mother Espresso” not exactly screaming “North Tea Power” at me. Like its parent, Mother Espresso does many things, excelling at them all, from coffee through tea, craft beer, wine and cocktails to an impressive food menu. 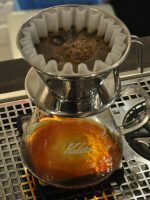 The coffee is from Has Bean, with a pair of single-origins on espresso (for milk and black drinks respectively), while there’s also pour-over and batch-brew. To mark my return to the UK, Monday’s Coffee Spot is somewhere I’ve been meaning to visit for all most as long as I’ve been doing the Coffee Spot. Expresso Base is in the courtyard of St George’s Church, near the British Museum and just across the way from the original site of Wild & Wood. It’s easy enough to miss and is closed over the weekend, which might go some way to explaining how I’ve managed to not go there for almost four years (which, incidentally, is how long Expresso Base has been going, having opened a few months before I started the Coffee Spot). Essentially an outdoor café, Expresso Base occupies the right-hand side of the churchyard, with plenty of seating and a gazebo at the back which houses the two-group La Marzocco. If it’s raining, additional umbrellas, etc, can be put up to provide shelter, but on a sunny day, there’s nothing better than sitting on one of the wooden benches and enjoying your coffee in the sun. The coffee, from Has Bean, is always a single-origin and changes on a regular basis, while there’s a small selection of cake if you are hungry. There’s also a guest roaster which changes every week. Lemana, in Lymington, just outside the New Forest, has been a favourite of mine since my first visit in November 2013. A friendly, family-run, community-based café in a small town, it had excellent food and outstanding cakes, plus one of the warmest welcomes you’ll find. The only thing I didn’t rave about was the coffee. However, when I heard on twitter that Lemana had started serving coffee from Staffordshire legends, Has Bean, my ears perked up. A return visit was quickly pencilled in as part of my annual trip to Naish, just along the coast from Lymington (which, contrary to my initial belief, is in Hampshire, not Dorset). The switch to Has Bean is the most obvious of the changes, which have included taking a range of loose-leaf tea from Dorchester’s Gilded Teapot. Fortunately the warm welcome, excellent food and outstanding cakes remain, while other changes have been more subtle. November 2018: since I wrote this update, Lemana has changed hands and now uses local roaster, Coffee Monger’s Roasting Company. To see what else has changed, see my latest Coffee Spot Update. The original 6/8 Kafé (now sadly closed), one of Birmingham’s first specialty coffee shops, was a cosy, compact spot on Temple Row, right in the centre. The new 6/8 Kafé is about as far away from that as you can get in almost every respect except that both serve excellent coffee. 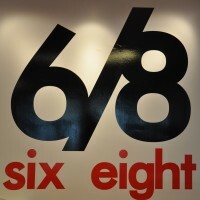 Located in Birmingham’s new Millennium Point development, the new 6/8 is filling a valuable niche: serving speciality coffee in a mass-market setting. Millennium Point is a science centre extraordinaire, housing Birmingham’s Thinktank science museum and faculties from both Birmingham City University and Birmingham Metropolitan College. 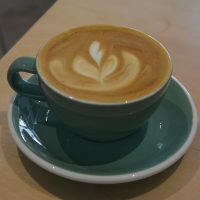 And 6/8 Kafé. Frankly, I take my hat off to Devinder, 6/8’s owner, both for getting such a high-profile spot and for having the bravery to go for it. It’s exactly the sort of spot you’d expect to see a run-of-the-mill chain, so it’s refreshing to see somewhere serving excellent coffee. And make no mistake, although Millennium Point lacks the original 6/8 Kafé’s cosy atmosphere, the quality’s every bit as good. The only compromise is dispensing with hand-pour filters, sticking instead to a single Has Bean blend on espresso. That said, it’s a pleasant place to sit and drink your coffee or quickly refuel before/after visiting Thinktank. Almost a year after featuring Fernandez & Wells for the first time, with the delightful Exhibition Road branch, I thought it about time that I got around to writing up the Somerset House branch, where I’ve been a semi-regular visitor through the year. Set within Somerset House itself, with stunning views of the courtyard and, in the summer, copious outside seating, it’s one of the most physically appealing Coffee Spots that I’ve been to. Inside, high ceilings and large windows give it an immense sense of light and space, while multiple rooms, on a par with Paris’ La Caféothèque, means that there’s something for everyone. A cross between wine-bar, deli and coffee shop, F&W’s food and coffee are as outstanding as the setting. Somerset House has a similar offering to Exhibition Road, with perhaps a slightly more extensive menu, which never fails to amaze and delight me. 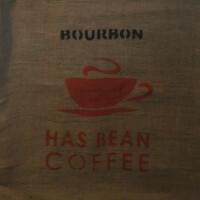 The coffee’s from Has Bean, with a bespoke house-blend on espresso. Open late into the evenings, it’s the perfect spot for an after-hours coffee or a bite to eat and while I haven’t tried it, the wine selection looks excellent. In the summer, it’s one of the best outdoor cafés in London. On the pedestrianised Central Road, located, appropriately enough, right in the centre of Leeds, is the delightful Mrs Atha’s, perhaps one of the most complete coffee shops I’ve been to in ages. With a lovely interior, cosy little basement and small outside seating area, there’s plenty of seating options. The coffee is provided by stalwarts Has Bean, with a house-blend, the charmingly-named “Mrs Atha’s Little Tipple”, on espresso and a single-origin on filter. There’s also a selection of single-origin filters from regularly-rotating guest roasters, quite often from Europe. Typically, I arrived the day before Mrs Atha’s new espresso machine, a Slayer no less, was due to be installed! Tea drinkers are also well catered for, with a wide selection of loose-leaf tea from Postcard Teas. As good as the coffee (and tea) is, Mrs Atha’s is just as much about food, with a comprehensive all-day breakfast menu complimenting lunch and a selection of (very) specials, all of which are prepared in the basement kitchen. Add to that a wide range of extremely tempting cakes and you can’t really go wrong. There is, by the way, a Mrs Atha: she’s the grandmother of the three brothers who own Mrs Atha’s. Fernandez & Wells is a small London-based chain with six (so far) branches, the original two in Soho, one in Somerset House, this one on South Kensington’s Exhibition Road and, since 2014, two more in London. A cross between wine-bar, deli and coffee shop, F&W offers a similar experience to Notes, albeit in (slightly) less grand surroundings. 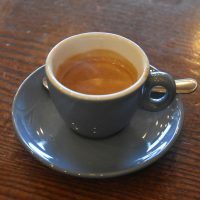 Literally a stone’s throw away from Monday’s Coffee Spot, Islington’s Tinderbox, we find relative newcomer, the CoffeeWorks Project, which recently celebrated its first birthday. In fact, you could see Tinderbox from the CoffeeWorks Project’s front window and vice-versa, were it not for the brick-built arcade, now occupied by a Jack Wills, which separates Islington’s Upper Street (Tinderbox) from the High Street (CoffeeWorks Project). The CoffeeWorks Project, as the name implies, is all about the coffee, although that shouldn’t detract from the excellent sandwiches and cakes, plus the quirky layout and lovely garden (sadly closed in the winter). However, pride of place goes to the Slayer espresso machine, the only one in London and one of (I believe) just four in the country. Using this beauty, owner Peter and his team get the best out of their Has Bean coffee, throwing some very impressive pour-overs into the mix. While I was there, the CoffeeWorks Project had two espresso single-origins, plus a decaf single-origin, to go with another three single-origin pour-over options and a bulk-brew filter thrown in for good measure. I did my best to sample them all, but may well have to return for another go! December 2016: The CoffeeWorks Project is now a mini-chain with three branches (this, Leadenhall Market and Blackfriars Road) and, since the summer, it has been roasting all its own coffee. September 2018: Good news and bad news. The CoffeeWorks Project is now a mini-chain with five branches, but sadly the Leadenhall Market branch has had to close.